The SilverFit Mile is installed onto an existing treadmill, home trainer, or active/ passive trainer (for example the Thera or MotoMed). It is also possible to connect the Mile to more than one apparatus at a time. A route is shown on the big screen in front of the apparatus. The speed at which the film plays is determined by the speed at which the user moves. This gives a feeling of actually exercising outside. The SilverFit Mile is a CE certified medical tool. This means that it has been through a lengthy control process to establish the system’s operation and avoid any possible risks. Besides the fact that this certification is mandatory in healthcare, it also brings with it many practical advantages. For example, it is important that the speed of the films adjusts automatically and that the imagery does not move or jolt. If it moves too much it can cause a risk of falling. SilverFit installs the entire system at your location and offers good quality and service. We are also happy to advise you when purchasing a new bicycle, trainer or treadmill. The screen is impressive and immediately attracts attention. The user is absorbed into the experience. The film is not animated, but recorded live with a camera creating a unique and realistic experience. People who are present in the room, but not actively participating in the exercise enjoy looking on. This results in conversation and increased social cohesion. There is a wide range of routes, through towns, countryside and unique locations such as Amsterdam, Paris, Ravello, Patagonia, Swiss Alps and Schiphol Airport. 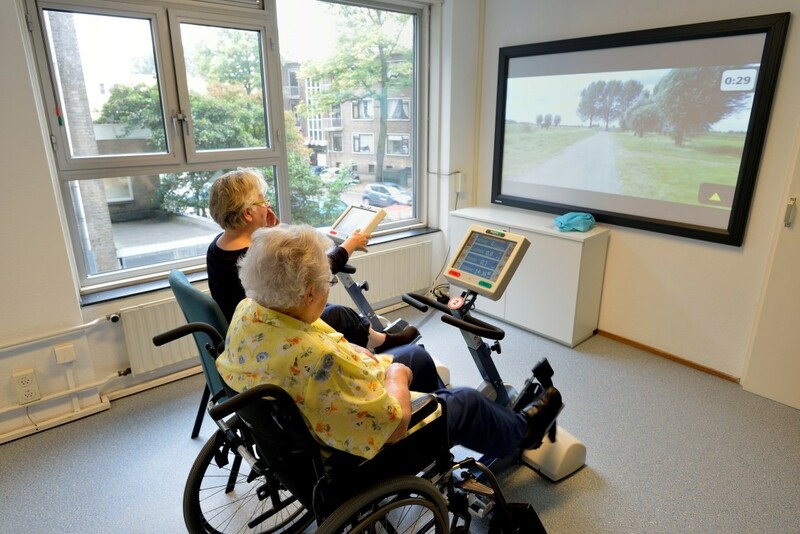 As the user is focused on the experience, they are likely to walk or cycle longer because they lose track of time. People often aim for a specific goal in terms of the film, such as, ‘now I am going to walk to the church’. As their attention is focused on the screen and not on the control panel, they are more likely to walk in an upright position. It is also possible to do a route in different stages, carrying on where the user left off the last time. Although functional training is often preferred, strength training exercises play an important role in rehabilitation. For example, exercises on a leg press after an orthopaedic surgery; recuperating from sarcopenia after long-term bed rest. Often these exercises are repetitive and have to be performed over a period of time. Games motivate people more than straightforward exercises. The games used on the Newton are professionally designed in terms of graphics, sound, and game layout. 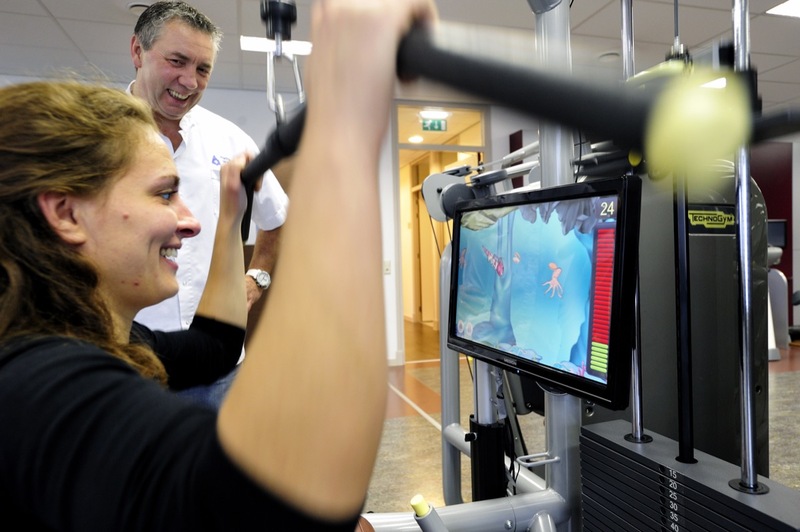 The level can be adjusted to suit the abilities and experience of the patient. 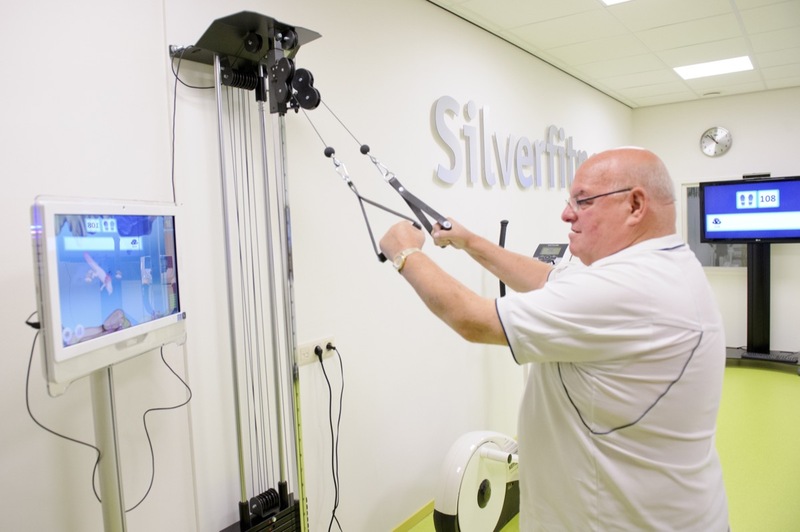 The SilverFit Newton can also be used to make standard exercises easier. For example, counting down the number of repetitions by indicating the pattern in which the exercises are done, or by measuring the recovery time. The SilverFit Newton can also assist in taking a series of standard tests, such as the 1RM test. Whereby a series of interpolations calculate the maximum weight that is to be lifted. 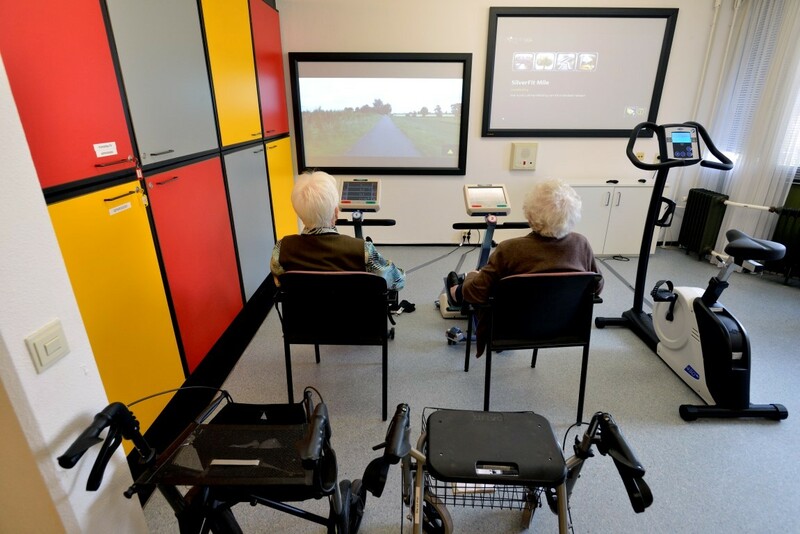 The system allows patients to be recorded and compare their performance over a period of time.